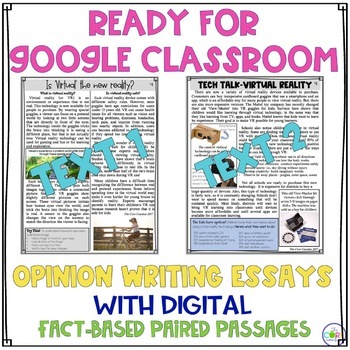 Help your students form stronger opinions (argumentative in 6th) and create quality written essays using fact-based paired texts about virtual reality. Students are given an engaging focus question, then read these perfectly paired texts on a topic they actually WANT to write about. Students search the texts for reasons, evidence, examples, facts, and details that support their opinion, then organize their thoughts on the graphic organizer. 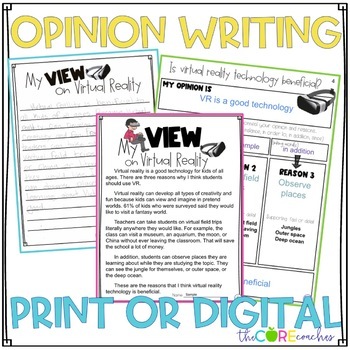 The organizer supports students as they write their final opinion pieces, complete with all components necessary to meet your grade level opinion writing standards. 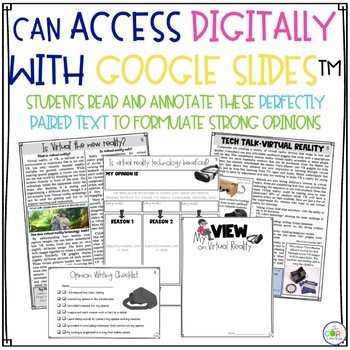 Teach opinion writing in style. Your students will thank you! If you are looking for a great informational or explanatory writing resource, try the fact-based paired texts about Plate Tectonics, Volcanos, Layers of the Earth, or Earthquakes. Watch for more titles in the near future! 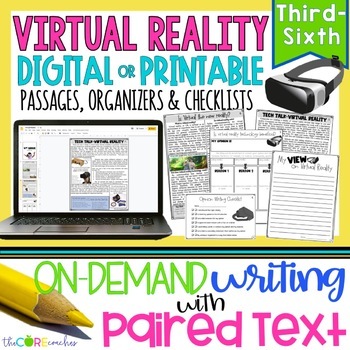 Read our blog post on how we used paired texts in the classroom.